Rio de Janeiro. Mike Egerton/PA Wire/PA Images. All rights reserved.In mid-May 2008, a journalist, photographer and driver were kidnapped and tortured in Batan, a favela in Rio de Janeiro's west zone. When the news of the incident emerged, it electrified the nation and sent shockwaves around the world. The team was assembling a story on the city's little known militia - self-styled vigilantes who ruled poor communities at gunpoint. Unlike the notorious drug gangs, the militia included former soldiers, police, firefighters, and prison guards. Fast-forward to the present, and the militia are again making headlines. This time they are the chief suspects of a targeted assassination of Marielle Franco, a black city councilwoman and her driver, Anderson Gomes. Marielle was a former advisor to the very same state congressman - Marcelo Freixo, now the leader of the left-wing PSOL party - who investigated the militia a decade earlier. Yet despite their heroic efforts to curb the power of Rio's gangsters, the militia are stronger than ever. There is some uncertainty about when or where the first militia groups first emerged. Some analysts believe that the militia were first founded in the 1990s by military police living in gang-infested communities. The militia first made headlines in early 2000, when a string of media stories reported on their illegal activities that included charging businesses and civilians for "security services". Unlike social cleansing and extermination groups, which had existed in Brazil for decades, the militia initially restricted their activities to expelling gangsters and defending neighborhoods from drug trafficking. At first, most locals embraced the rise of the militia, in some cases volunteering resources. In time, as the ruthless tactics of these groups emerged, the public mood soured. The militia never worked for free. They funded their day-to-day activities by imposing a security tax in areas under their control, requiring monthly contributions from local businesses and residents. At first, most locals embraced the rise of the militia, in some cases volunteering resources. In time, as the ruthless tactics of these groups emerged, the public mood soured. Cesar Maia, the city's mayor from 2001 to 2008, described them as “a lesser evil”. As the militia grew, Maia later stated ominously that the militia might eventually come back and bite the hand that feeds them. The militia gradually extended their power and influence. They did this by quietly diversifying their income streams. Not only did they expand extortion rackets to all manner of businesses, but they also started charging fees for pirated TV, electricity and water services, and Internet connections. Some groups also levied fees on informal transport services, evicted populations to clear land for realtors, and brokered access to public housing programs such as Minha Casa Minha Vida. In time, militia groups also started infiltrating municipal politics, including by getting out the vote at gunpoint. The militia also came under scrutiny by local academics. Ignacio Cano, researcher at UERJ, defines them as irregular armed groups made-up of law enforcement agents motivated chiefly by rent-seeking. They secured territory, guaranteed law and order, and achieved some legitimacy by offering protection. Another scholar, Michele Misse,from UFRJ, offered a similar description, calling them mafia-type networks that extort citizens under the pretext of offering protection, exploiting political commodities subtracted from the state's monopoly of force. With the protection of well-placed politicians, the militia spread like wildfire. They initially targeted Itanhangá, Jacarepaguá and Campo Grande, but quickly expanded across the metropolitan region and state. 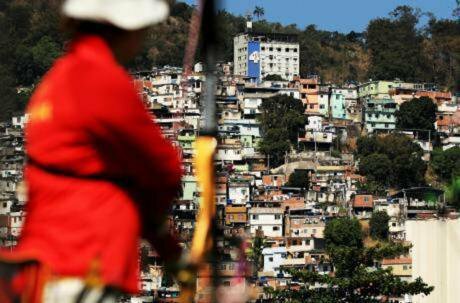 Today, an estimated two million people live in areas under militia influence in 11 municipalities across metropolitan Rio de Janeiro. Militia surpassed drug trafficking gangs as the top complaint to the Disque Denúncia hotline, accounting for 6,475 - 65% - of anonymous calls on militia/drug trafficking between 2016 and 2017. Militia fortunes started to change in May 2008. They became equated with the very drug trafficking factions and mafias they claimed to stand against. Militia fortunes started to change in May 2008. Once feted as custodians of public order, they soon became equated with the very drug trafficking factions and mafias they claimed to stand against. A Parliamentary Commission of Inquiry, or CPI, revealed the extent of their criminal activities. In an unprecedented move, some 220 militia and associated politicians and business people were indicted, with recommendations to dismantle the militia's grip on the communities they dominated. Yet as is so often the case in Brazil, few of the CPI recommendations were ever implemented. Counter-militia measures have focused almost exclusively on policing activities, including arresting and prosecuting the leadership of Rio's dozens of illegal groups. According to the state secretary for public security, at least 1.387 people connected to the militia have been arrested since 2006, including Jerominho and Natalino, two especially notorious leaders. Some of these arrests are a product of investigations and operations led by DRACO, an organized crime investigation unit, and GAECO, the anti-organized crime special group of the state Prosecutor’s Office. Some of these counter-militia efforts have been criticized for being half-hazard and even counter-productive. Take the case of the April 2018 operation that resulted in the arrest of 159 suspected militia attending a party in Santa Cruz, in the west zone of Rio de Janeiro. More than 40 police officers were involved in the nighttime raid. Not only did the militia leader escape, at least 138 of the suspects were released the next days due to lack of evidence. Neither periodic police sweeps or large-scale community policing efforts (such as the pacification police units) have slowed the advance of militia. There are signs the militia problem could worsen. There are signs the militia problem could worsen. Militia leaders convicted in 2008 have served out their time and are now being released from prison. Some of them are returning to crime organizations that are politically and economically stronger than before. Far from shrinking in size, militia has expanded from 41 to over 88 communities since 2010. There are also signs of renewed community sympathy for certain militia groups, especially as public confidence in the state's military and civil police force plummets. Rio de Janeiro's public security sector is in free-fall: its budget - discounting payroll - has reduced to almost zero in the past ten years. Militia also appears to be learning some lessons. Most leaders are avoiding seeking political office and are keeping a lower profile. That said, they are continuing to shape the direction of politics. For example, some militia groups are brokering the election of their preferred candidates. There is a lively market for getting out the vote in areas under militia control. Politicians are frequently charged a fee to campaign in areas under militia control. And with the police focused on containing drug factions like Comando Vermelho, Amigos dos Amigos, and Terceiro Comando Puro, militia are continuing to expand their influence. Although once staunchly opposed to drug trafficking factions, militias have also moved into the drugs business. Lured by the promise of sky-high profits, some milicianos and drug trafficking factions are working in partnership, including selling and transporting narcotics. In 2015, the state police discovered a drug shipment with the logo of a large criminal faction next to a logo used by the largest militia. Not surprisingly, tensions have also emerged between criminal factions and militia groups over the control of Praça Seca, Jordão, Carobinha, Morro do 18 and Fubá - all areas involved in the retail of cocaine. A punitive approach to containing militia expansion is not working. While strengthening the capacities of policing entities such as DRACO and GAECO is essential, a more effective approach would involve targeting the source of militia economic power. Working in partnership with federal police, prosecutors and intelligence, law enforcement must follow the money, squeezing the potential of militia to profit from pirated utilities, racketeering, extortion and, of course, the drugs trade. This will require working in partnership with public utilities, cable and telecommunications operators, to tighten regulation and inspection efforts and of course civil society associations. Local authorities will also need to redouble efforts to recover and control territory if they are to reduce the predatory power of the militia. This means providing basic services to marginalized neighborhoods under militia control. Restoring social cohesion in traumatized communities and building trust in the government is a sine qua non of diminishing the power of militia groups. This will take time. It will also require a clear-headed plan with realistic targets. Most important, it will require a strategy that moves beyond repression alone. 1990s - Militia groups are conceived. 2005 - Media outlets detected militias in the West Zone of Rio de Janeiro. 2006 - In December, a series of attacks against police units and buses in Rio were conducted by drugs gangs in retaliation against militia. 2007 - Félix dos Santos Tostes was murdered during a fight over Rio das Pedras and councilmen Josinaldo Francisco da Cruz (Nadinho) and Jerônimo Guimarães Filho (Jerominho) were arrested. 2008 - In May, a team from “O Dia” was kidnapped and tortured by militia members, in Batan, leading the Legislative Assembly of Rio de Janeiro to create a Parliamentary Inquiry Commission (CPI) to investigate militias. 2009 - In May, Ricardo da Cruz Teixeira, alias Batman, was arrested after seven months as an escapee. In June, Nadinho de Rio das Pedras was murdered. 2010 - The state Prosecutor’s Office created GAECO, an anti-organized crime special group to prosecute and investigate militia-related crimes. 2012 - In September, the federal government sanctioned a law outlawing militia activities. In the elections, militia members lost political power. 2013 - The former military police officer Toni Ângelo Souza Aguiar, one of "Liga da Justiça" leaders, was arrested. 2014 - The former military police officer Marcos José de Lima Gomes, alias Gão, was arrested. Media outlets published pieces on milicianos and drug dealers working in together. 2015 - In August, a civil and military police-led task force carried out an operation to tackle militia activities in the federal housing program "Minha Casa, Minha Vida", in the West Zone. 2016 - At least six cases of politicians and candidates' killings were connected to militias. 2017 - In April, Carlos Alexandre da Silva Braga (Carlinhos Três Pontes), suspected leader of "Liga da Justiça"’s rapprochement to drug gangs, was killed by police officers. 2018 - In March, the councilwoman Marielle Franco and her chauffeur Anderson Gomes were executed. Police suspect Militia involvement. Militia is also suspect of murdering five youth were murdered in Maricá.